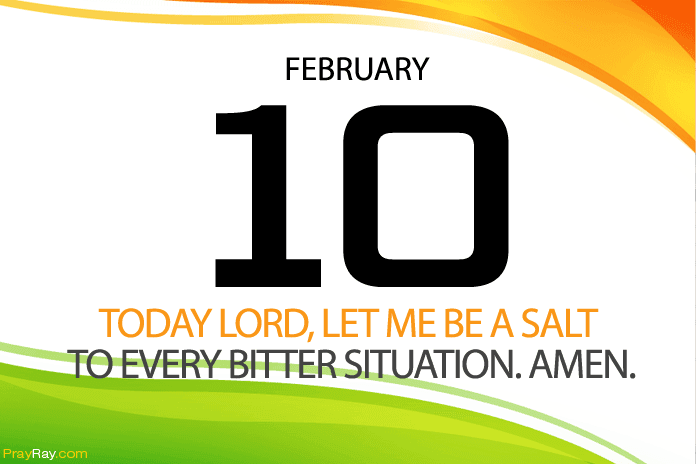 Salt of the World – Prayer for February 10 – Salt of the world Bible verse repeats the words of Jesus. We are made the salt of the world to take away bitterness in this world and bring in sweetness through Christ. Let’s tell God to make us a salt that will sweeten the world and never lose our taste. “You are the salt of the earth. But if the salt loses its saltiness, how can it be made salty again? It is no longer good for anything, except to be thrown out and trampled underfoot” (Matthew 5:13). Jesus called us the salt of the world because He knew the benefits of salt. It gives taste to a food, it is being use for preservation to. We are in Christ and we are made salt of the world to sweeten it and preserve it. People have been in bitterness always, there are sorrows weighing people down. Therefore, we as the salt of the world, must look into these lives and impact them, we must let them enjoy the full benefits of Jesus. By doing so, we have sweetened their lives and preserved their soul. Salt can lose its taste too and when we sin, we tend to lose our taste. When we are not at peace with people, we can lose our taste as well. And we must follow Jesus wholeheartedly so that we can preserve the world and not lose our taste. So in whatever thing you do today, be at peace with people and follow Jesus wholeheartedly and then, you will not lose your salt. You will be the reason why everyone is happy and you will always be number one at you place of work or school. You made us salt of the world Lord, and we should sweeten it and preserve it. When a salt loses it taste, it becomes invaluable. Lord, I don’t want to lose my taste, I want to impact this world, I want to sweeten it and preserve it by your power that works in me. I can’t achieve this by my own power, I need you to do it. Today Lord, let me be a salt to every bitter situation. Amen.